What boggles my mind in cases like this is: Why didn’t the sign-maker or, in the case of terribly incorrect Chinese Food takeout menus, printer pick up on this error??? I am a graphic designer who has worked on the pre-press side of the industry, and if this mistake was allowed through to press, it was on my head. Unbelievable, and terribly annoying. Perhaps "rejunivate" means to go back to the beginning of the summer? With all the rain we've had, we deserve an extra couple of sunny weeks in June. Yeah, it's pretty strange that no one noticed this glaring error. I think we are all being a little harsh here. 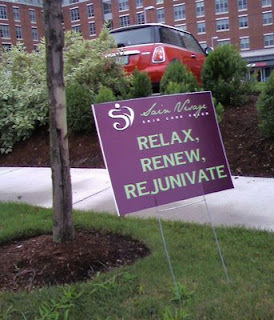 This sign is CLEARLY saying Relax, Renew, then once you're feeling better, throw juniper berries over the V.A.T.E. (Virginia Association of Teachers of English) for the second time.